V-Cleat Internal Halyard Flag Poles - Admiral Flag Poles, Inc.
Internal Halyard V-Cleat flagpoles are constructed from all new 6063 aluminum, heat treated to a T6 temper and feature a uniform taper. They use a manually operated internal halyard system that conceals the rope on the inside of the shaft. 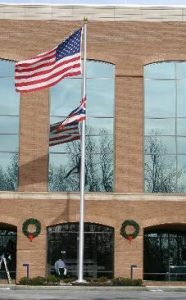 The concealed halyard system deters flag theft and vandalism that is more common when flags are flown 24 hours a day and there is a limited presence of people, such as businesses, schools and parks.